As Jammu and Kashmir is in a bit of uncertainty over the challenge to Article 35A of Indian Constitution in the Supreme Court, it has come to fore that not just one but three petitions challenging the validity of the law have been filed in the apex court. From questioning the President’s powers to claims that Article 35A violates basic structure of the Constitution of India and promotes gender bias, the petitioners have taken different grounds to challenge the Constitutional provision that grants special rights to residents of Jammu and Kashmir. J&K’s advocate general Jahangir Iqbal Ganie confirmed to Greater Kashmir that three petitions have challenged the Article. The petitioners – We the Citizens, West Pakistan Refugees Action Committee and Charu Wali Khanna/ Dr Seema Razdan – have respectively challenged the Constitutional provision in 2014, 2015 and 2017. The Article 35A was incorporated in the Constitution of India by the President through the Constitution (application to J&K) Order 1954. Under Article 35A, the J&K legislature is empowered to define permanent residents of the State and grant special rights and privileges to them. It protects all the state laws and rules that prohibit non-state subjects from acquiring land in the state, apply for government jobs and scholarships or participate in state and panchayat elections. This petition has been filed by Delhi-based little known NGO “We the Citizens” in the year 2014. Those associated with the non- governmental organization have close links with the right-wing Hindu groups. In this petition, the NGO has prayed that Article 35A should be struck down, claiming that President has no powers to insert new Article in the Constitution of India. “The Constitution (application to J&K order 1954) has been issued by the President of India by exercising power conferred under clause 1 of Article 370 of Constitution of India. A perusal of Article 370 would clearly show that there is no power conferred on the President of India to amend Constitution by incorporating any new Article in the Constitution. Therefore, inclusion of Article 35A within Part-III of the Constitution of India is absolutely unconstitutional. Therefore, the provisions contained in Presidential Order 1954 may be declared to be unconstitutional,” the petition reads. The West Pakistan refugees have filed a petition to challenge Article 35A along with Section 6 of the J&K Constitution. It has been questioned on the grounds that basic structure of the Constitution of India cannot be amended. 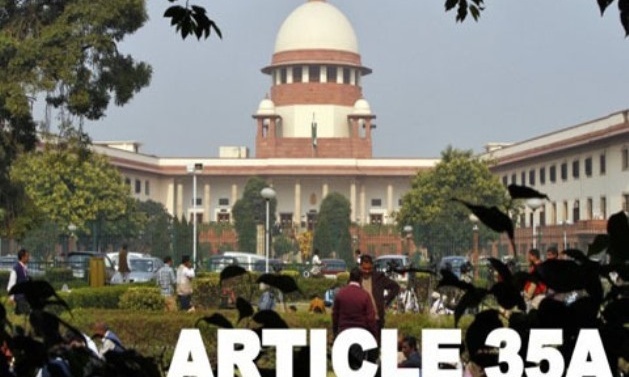 “Article 35A is ex facie unconstitutional as it seeks to sanctify deprivation of fundamental rights of a class of citizens of India residing in the State of J&K…….. By a series of judgments including Keshavananda Bharati, fundamental rights have been reckoned as core aspect of the basic structure. Article 35 A has been positioned by an executive fiat of the President exercising powers under Article 370. It is emphasized that under no circumstances can the president under Article 370 do what by the Parliament is disentitled by the judgment of this Court Keshavananda Bharati versus state of Kerala,” the petition reads. The Section 6 of J&K Constitution defines permanent residents of the state on the basis of two notifications issued by Maharaja Hari Singh in 1927 and 1932. The West Pakistan refugees are seeking state subject rights like right to acquire property and apply for government jobs in the State, the petition reveals. One more petition challenging the constitutional provision has been filed by Charu Wali Khanna and Dr. Seema Razdan. The petitioners have claimed that Article 35A promotes gender bias and discrimination. “Under the guise of Article 370 and Article 35A, the men and women are subjected to different treatments and discriminated on the basis of gender,” reads the petition. Charu Wali Khanna, according to the petition, claims that her family had migrated from Kashmir during Afghan rule (1753-1819).